Last year for the first time we hilled our potatoes with straw instead of dirt. We promised to keep you posted on the result. Let’s look into our experiment. We planted the potatoes as per usual about 4 inches deep and about a foot apart. Then, once it was time to hill them, we put straw all around them. Our hope was to have less backbreaking digging to do. In early September we had snow and frost, some of the potatoes were almost done by that time anyways, so they died back and we dug them up. One variety however, German Butter Cup, is a late potato. It was still growing. We noticed that the straw protected the still green plant from the heavy snow and frost. It saved the plant. We dug them out in late October. When we moved the straw away the potatoes were right there – there was very little digging to do. The straw mulch wasn’t thick enough everywhere, some potatoes turned green. For the most part though it worked great. It is important to put a thick layer on them. The straw made a bit of a mess in the garden. We would not mind it if it was our garden, but since we are growing potatoes at a farm garden it did take some clean up. Other than that it was a successful experiment and we might just do it again. Is it possible not to plant potatoes in the ground at all, just place them on the soil and cover them with a thick layer of hay or straw? Ruth Stout did grow potatoes this way. Here’s her book: Gardening Without Work . 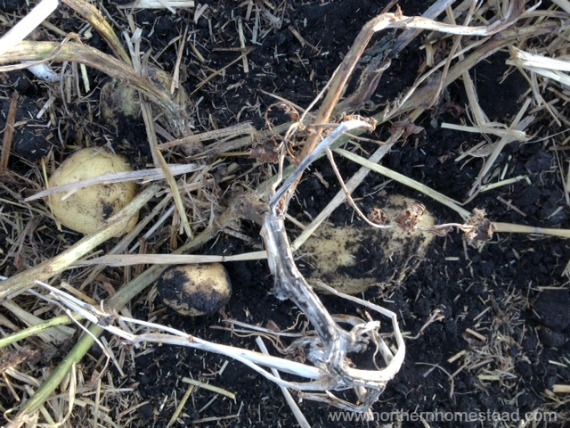 Lesa, who tried to plant potatoes not in the ground at all, just places them on the soil and covers them with a thick layer of hay or straw, finds that to bury the seed potatoes a couple of inches into the soil works better. You can read all about it at: Better hens and gardens. Good info to have. 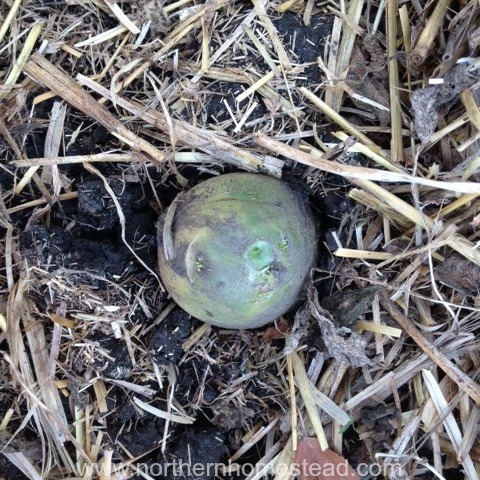 Do you think this would help avoid potato scab? We have that here in our soil. I do not think so, sorry. But it sure is worth to try. Also make sure to get new and healthy seed potatoes and rotate potatoes with other crops in the garden. Hope this helps. How did you keep the mice out? It was my problem~~and frustrating too! We did have some kind of rodent at the farm garden, but I did not think those were mice. And I also did not make the connection to the straw, since it (whatever it was) was all over the garden, not just where the straw was. It makes me think though. What kind of yeild did you have with straw and do you think you have to water more? We had so much rain, couple times hail and finally snow in early September. Still we harvested about 5 potatoes per hill on average. Less than what we would usually get from our previous garden, but considering the circumstances, not too bad, I think. What a great idea! Digging potatoes is hard work, I’d rather clear some straw away. It sounds much easier! I’ve had the best luck with a combo approach. Dig trenches approximately 8″ deep, depositing the extra soil adjacent to the trenches. 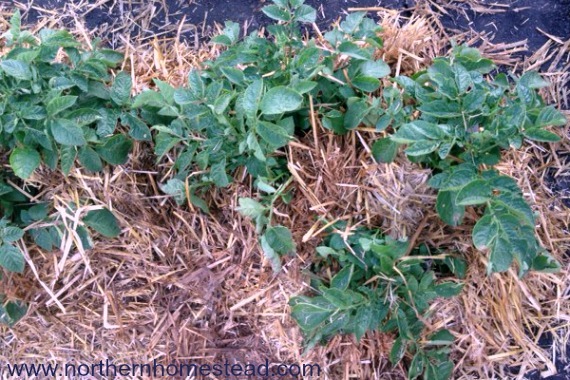 Drop in seed potatoes and partially backfill the trenches. 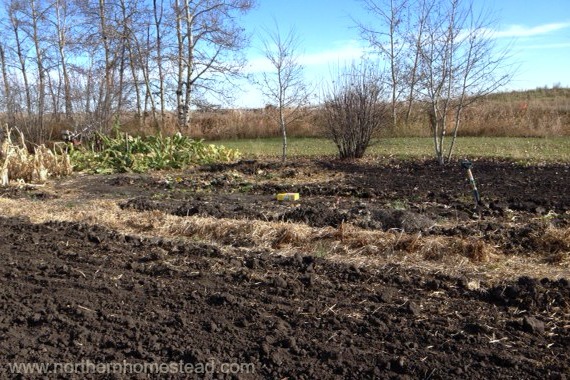 As soon as you see leaves popping out of the soil, backfill a little more. Keep doing this for a couple weeks until your trenches turn into hills and vice versa. Now mulch HEAVILY with straw, between the rows and on the sides of the hills, everywhere. Don’t spare the mulch – tease the straw bale apart and spread it really thick – like a foot deep or so (it will settle quickly into a few inches). I have tried many different methods of growing taters, but this is always the most productive. Thank you for sharing, love to hear real life experiences. I think we just needed more straw for ours, and better soil. We are trying a different farm garden this year. Do you have any suggestions for preserving potatos so they last all winter? We have loads still in the ground and Im not sure what to do with them. We too have lots of potatoes still in the ground. We dig them late in fall (end September – beginning of October, depending on the weather). At that point the house is already cooler and we are able to store them in our cold room all winter long. If you don’t have a cellar, dedicate a room in your basement for potato storage. It can be a closet that is not close to the heating and is dark. Potatoes store very well for months.